Are done. That’s all he wrote, so that’s all I wrote. One thousand three hundred days ago I set out to read each of the 38 plays Shakespeare wrote. I have had a crush on him since I can remember and very simply felt that I could not call myself a true fan unless I’d read them all. The decision to blog about each one just provided extra incentive lest I languish in lazy procrastination. I had read or seen about a dozen of them prior to this project, but that’s less than a third of the oeuvre. I have enjoyed every word. Some more than others, admittedly. The writing was a chore and a challenge but made me achieve my objective of delving ever further into, and increasing my appreciation of, his work. Those who are either genuinely interested, or simply humoring the crazy lady, ask, “Which is your favorite?” This is patently impossible to answer. Like our children, we may love different attributes in them, but we love them all unconditionally and eternally. In general, I prefer the tragedies to the histories and romances and the latter to the comedies, but any given play on any given day can prove the exception to that loose rule. Some of the tragedies are just so-so, and a few of the comedies are genius. And I hold Henry V and Richard III in very high esteem. There’s just no way to pick a favorite. I fear I disappoint when I cannot summarize plots and spout lines at will, but alas, it’s been nearly three years. My brain is older. I read the plays; I didn’t memorize them. And alas again, they are not all particularly memorable (that feels slightly like heresy as I write it). Those same genuinely interested or polite people ask, “What’s next? His sonnets?” Definitely no. I’m allergic to poetry. Maybe I’ll dig into James Joyce’s Ulysses chapter by chapter. If I throw in Finnegan’s Wake, that will take me through and long past retirement age. In the immediate future I will turn my attention back to the dreaded task of revising a memoir about three months on a German container ship in 1979. I was never very good at checking my work. I feel satiated with Shakespeare, but sad. I love him because his words make me laugh and cry. Sometimes in the same line. I love him because his “words, words, words” (Hamlet) are seared in our collective psyche such that they have elucidated it and become an inextricable part of its fabric. I love him because the wisdom and insights in his plays are universal and timeless. 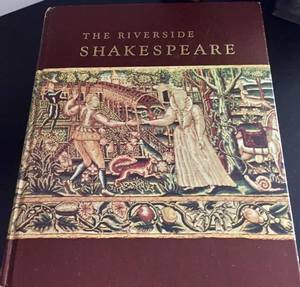 So I close the copy of The Riverside Shakespeare that I bought at Middlebury College for $22.50. It is now full of margin notes from both my classes there and this project. I know I can visit him any time, but I will miss seeing him every day. Parting is, indeed, sweet sorrow.